Viewers new to sites using MediaWiki may not be familiar with their functionality and layout. Additionally, StrategyWiki has its own default skin and policies to give the site a unique look and feel, which even wiki veterans may not fully understand at first glance. This page explains the navigation and different aspects of the site for ease of browsing and getting where you're to go. The left nav has links to some of the most important and useful pages on the site, and is viewable on nearly every page. You can use the left nav to get help from this Guide or the chat room, upload a file or get back to the front page of the site. Here is a quick reference of where each link will take you. Main Page: This link goes back to the main page where you can see any announcements or one of our featured guides. Forums: Takes you to the abxy forums, where global issues and changes for StrategyWiki are discussed. Chat: Discord allows you to consult with StrategyWiki experts for help in editing the site, and has a channel for real-time collaboration with other users. For connecting to the Discord channel, see the Discord page. Community portal: This is a page dedicated to any ongoing projects and other ways to help StrategyWiki. Recent changes: See the latest edits, page creations and new users to the site. Change how many edits are displayed over what timeframe in your preferences. Random page: Go to a random StrategyWiki game page. This could be anything from a guide's main page to its list of characters. Game categories: An ordered list of categories, for easily finding a certain group of games. Special pages: Special pages are a collection of reports, lists and other interesting pages about StrategyWiki. Upload file: This is a link to our upload page, where you can save an image to the servers and use it on one of the guides. There is a separate page for performing multiple uploads. Help: The help link takes you back to the front page of this Guide. The toolbox of this page, as seen by someone with the page on their watchlist. Another MediaWiki standard, the Toolbox is a grouping of tools that most commonly is found across wikis in the lower portion of the left navigation bar (for the Monobook skin). However, StrategyWiki's BlueCloud skin places the Toolbox in the upper right hand corner of every page, as seen in the image to the right. Watch/Unwatch: if you have a registered account and are logged in, you can use this link to add or subtract a specific page from your watchlist. Your watchlist is used to see if any of your favorite pages have been updated recently. Discussion: This is the talk page link. When it's red, it means that the page doesn't exist (there are no contents/discussions going on). Note that every page has an associated talk page; if you are looking at a subpage of a guide (i.e. Chrono Trigger/Walkthrough) and the talk page doesn't exist, you may want to check the main page of the guide (i.e. Chrono Trigger) to see if anyone is discussing anything. What links here: See a list of other pages that link to this one. Guide pages: Use this to see all the pages within a certain directory. It defaults to looking at all pages under the highest parent directory, but you can search subdirectories and you can also choose different namespaces to search. Related changes: This is supposed to show changes to pages linking to this one, but results may vary. 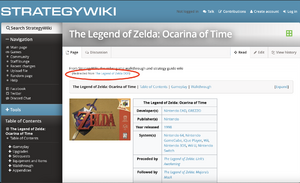 For more details on searching for pages or information, see StrategyWiki:Guide/Searching. The search function exists to more easily find information on the site. There's more to searching than just typing in a string of characters, and utilizing the added features will help you narrow down your searches and reduce the amount of time you have to dig through the thousands of pages available. When redirected, a small link appears under the title (circled in red). Redirects are pages that, when viewed, automatically load a different page instead. These are used for certain shortcuts, alternate game names, and common misspellings, however it's best to minimize the number of redirects that need to be created. These pages shouldn't contain any content that users would want to see, because the redirect will make it harder to access. For alternate game name redirects we add categories so that people that play games from different regions will still be able to find a game while browsing through categories, even if it has a different name. When you get redirected, the only thing that will notify you that a different page loaded, is the small link under the title in the upper left of the content portion of the page (see the image to the right). If you click this link, it will load the redirect page so you can directly access its content in order to edit the page, view additional content/categories that may be present, or access special pages via the toolbox. Remember that when redirecting to a category the page name must be preceded by a colon to make it a link and not tag the page with that category. Use [[:Category:Nintendo GameCube]], not [[Category:Nintendo GameCube]]. Double redirects are redirects which point to another redirect. These are to be avoided and must be corrected for simplicity. When you check the differences between one or more edits, you will see several things. Revision date, followed by edit and undo. Clicking edit will allow you to edit the revision, even if it is old. Be careful when submitting changes to old revisions, as you may wipe out a lot of work that has happened since. Clicking "Undo" will allow you to edit the page as if the revision you were looking at never happened. A diff will appear showing what was removed. Username, user's talk page, contributions, and block link (administrators only). Page section that was edited (colored gray). This can be clicked on to jump to that section. Followed by "show/hide" (administrators only). "Newer edit →" link: clicking on this will load the next diff in chronological order. Followed by "Mark as patrolled" (administrators only). This page was last edited on 14 March 2018, at 00:23. This page has been accessed 20,443 times.